how do you get yours to stay on? Quite pleased with myself today, I have to say. You see I love fascinators, so cute perched at an angle on the side of your head, but I hate headbands, you know the hard plastic alice band things. They just don’t fit my head, they start off ok ish but after a few hours the pressure pushing in behind my ears just gets too much and I have to take them off. The other option open to fascinators are large clips which spring open and snap closed, I usually lose some hair in these contraptions. Well having just finished a couple of fascinators, I woke this morning pondering on the best way to get them to stay on your head and then it struck me that small elastic loops would do the trick if there were enough of them so that you could apply a couple of grips to each loop hiding under the fascinator, coming from each angle to support from all sides. So a foray into the sewing box and a few buttonhole stitches later and this is what I’ve got and I am pleased to say it works well. And because they are made with elastic thread there is a little give in them to help with comfort aspect. win, win. Of course anyone buying a fascinator from me, would get their choice of headband or grips, so they could make their own decision, but I know which way I’m going from now on. Oh and it’s really only larger fascinators, smaller ones can have a small clip sewn on which is great. Well on a different rather exciting note, the lovely Jessica of Chronically Vintage (see my reading list on the sidebar for a link to her site) had a blog last week about a new site called House of Sass, houseofsass.com, who are fairly new and offering an amazing deal to all artists out there, 6 months free rental. Well count me in. So this afternoon will be filled with internet things I really find a little hard and sometimes frustrating, like just getting a photo to load where I want it, but hopefully by the end of it you may see a link appearing from this blog to a House of Sass shop and an Etsy shop and lets see which does better. Yay across the board! That's a brilliant – far more comfortable – solution. I'm not too keen on those hard plastic Alice bands either, they always, without fail, give me a headache if I wear one for very long. Your idea eliminates that issue entirely. Way to think outside of the (hat) box, lovely lady! 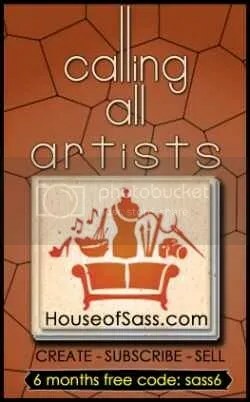 Thank you very much for the wonderfully nice mention of both House of SASS and my blog, I sincerely appreciate it.